A distressed woman was left with her arm trapped in a vending machine after reaching in for a bag of crisps. More than a dozen firefighters were called to American Express Corporate Travel, on the fourth floor of Stephenson House, in Cherry Orchard Road, East Croydon. The crisps had got trapped on top of the flap and, as the 30-year-old reached in, she got her lower arm wedged. A spokesman for the Fire Brigade said: "She was reaching in for a bag of crisps that had fallen down. "She was quite a small woman and she had managed to get her arm into the vending hole to try and reach up over the flap. 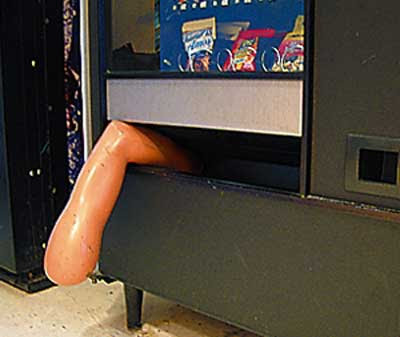 But she got her elbow caught between the flap and the base of the vending machine." Staff tried in vain to get the woman out for 15 to 20 minutes before the Fire Brigade's arrival, last Thursday. The spokesman for the Fire Brigade explained: "We had three fire appliances attend which amounted to 13 firefighters and a station commander. "We used a couple of crow bars to ease the flap up so she could take her arm out." The woman was given oxygen and one ambulance crew was called to the scene at around 10.45am. But she escaped uninjured and was not taken to hospital.